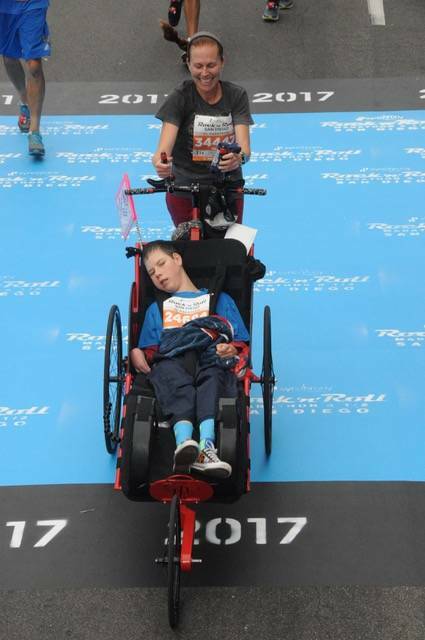 Cindy Spiva and her son, Cormac Evans, will run in the Rock ‘n’ Roll half marathon. When Cormac Evans is happy, his cross-country coach, Andrew Myette, notices certain tells. He’ll have a big smile plastered on his face. He’ll stick his hand up for a high five. 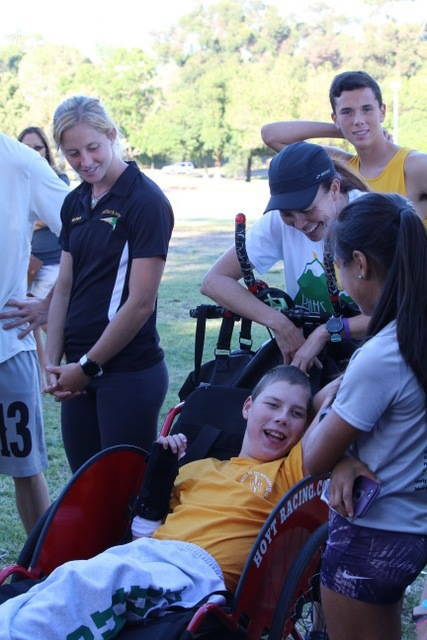 Evans, a 15-year-old from San Diego with hemimegalencephaly, a neurological condition that required surgery and left him paralyzed on his right side and nonverbal, is often at his happiest when he’s running. 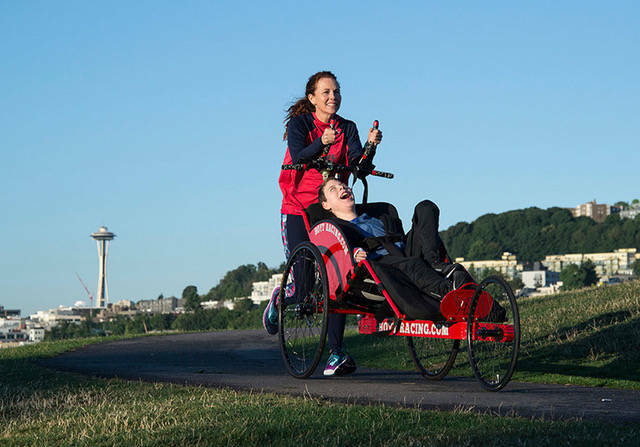 Evans and his mother, Cindy Spiva, are visiting Las Vegas this weekend to participate in the Toyota Rock ’n’ Roll half marathon, with Evans out in front and Spiva running behind and pushing him in a rig. 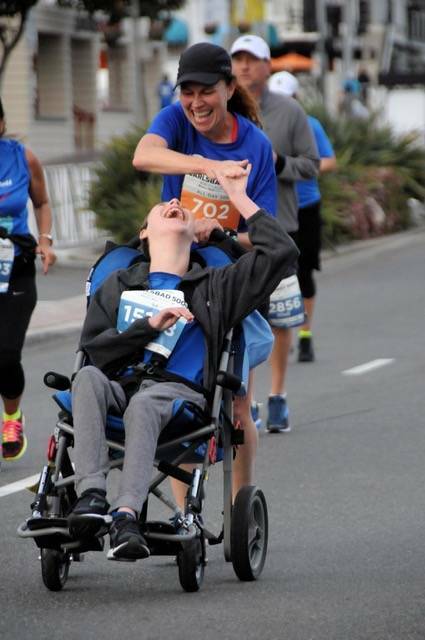 Spiva discovered her son’s love for running in 2016, when they participated in the walk portion of the Carlsbad 5000. After she saw her son’s reaction, they soon signed up for the San Diego Rock ’n’ Roll 5K. From there, they started running more frequently. Spiva, never a runner herself, downloaded a Couch 2 5K app and gradually increased her mileage, running a half marathon for her 50th birthday in February 2017 in Temecula, California, and pushing her son in the San Diego half marathon three weeks later. Later in the year, Evans joined his cross-country team at Patrick Henry High School in San Diego, though not without some initial trepidation from the school district, which was worried about liability. Myette was all for it, working with the family to make Evans’ inclusion a reality. As a sophomore this year, Evans has run in two invitationals and all but one of the team’s league races, Myette said. Evans often runs with family friend Larraine DeLoach, who sometimes fills in for Spiva, who is battling a knee injury and sometimes deals with fatigue stemming from multiple sclerosis. DeLoach will come with the family to Las Vegas to run in the race, but it’ll be Evans pushing her son around the Strip on Sunday. 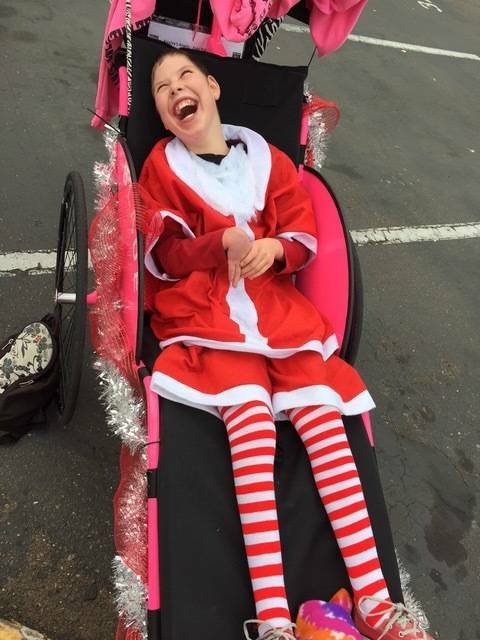 Along with running, Spiva said, Christmas lights and Disneyland are among Evans’ favorite things, so running along the Strip at night is a sensory experience she believes her son will love. And she loves being able to watch him participate — and participating with him. What: Road races on the Strip. Events: Saturday — 5k (6 p.m.); Sunday — 10K (4 p.m.), half marathon and marathon (4:30 p.m.).